Update: (June 25, 2018): After months of discussing its stores going out of business, Toys R Us will officially close all of its doors by this Friday, June 29, after being in business for 61 years. This includes all of its brick-and-mortar Babies R Us stores as well. Update (Feb. 21, 2018): Toys R Us has announced it will be closing an additional 200 stores across the US and will lay off a number of its corporate employees. This round of closings will cut the amount of US Toys R Us and Babies R Us stores the company had before it filed for bankruptcy last September nearly in half. 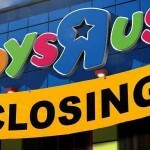 Original post: Toys R Us, once the go-to stop for kids’ toys and games before retailers like Target and Amazon came around, will be closing approximately 20 percent of its stores in the US come February. The company, which filed for bankruptcy in September 2017, noted that it plans to close 182 locations — including some Babies R Us stores — across the country in an attempt to restructureand reorganize its business going forward. “The reinvention of our brands requires that we make tough decisions about our priorities and focus,” said Toys R Us Chief Executive Dave Brandon in a letter posted on the company’s website. In addition to the closures (listed below), the company plans to merge around a dozen of its locationsinto shared Toys R Us and Babies R Us stores. Each location set to close will run sales before going out of business. Find out if your local Toys R Us or Babies R Us is in the list of locations closing in the US.